If you a value investor, you should consider financial sector stocks or equities. These financials sector provide good value with reasonable dividend yield. One of this top rated sector fund is described below. The Prudential Financial Services fund objective is to provide long-term capital appreciation. This Prudential Investments fund invests most of investable assets (>80%) in equity and equity-related securities of companies within a specific group of financials industries. It will invest in companies which operate in the financial services sector. The fund invests in securities of issuers among a number of different countries throughout the world, one of which may be the United States. It is considered as non-diversified sector equity fund. This financial sector mutual fund is managed by Mark T. Lynch. He has been the lead manager of this fund since January 2009. If you are interested to invest in this fund, there is a 0.30% 12b1 fee and 5.50% sales-load fee. The current yield of this fund is 0.11%. The last dividend distributed in May 2009 is $0.02. The expense ratio of this PSFAX fund is 1.44% per year. This expense ratio is lower than the average in the category which is 1.76%. This Prudential fund has returned 23.37% over the past year and 7.70% over the past ten years. The best 1-year total return was in 2009 with 83.61%. The worst 1-year total return was in 2008 with -35.78%. This PFSAX fund has YTD return of 5.67%. This top rated financials fund has received the highest 5-stars rating from Morningstar for its 7 years in positive return and 4 years in negative return. The minimum initial investment for brokerage account is $2,500 and $1,000 for IRA account. The minimum subsequent investment for both accounts is $100. This best rated sector fund PFSAX can be bought from 101 brokerages include JP Morgan, Merrill Lynch, Edward Jones, Td Ameritrade Inc, Schwab Retail, Datalynx, Morgan Stanley Advisors, E Trade Financial, etc. The other classes of this fund are Class A (Ticker: PFSAX), Class B (Ticker: PUFBX), Class C (Ticker: PUFCX) and Class Institutional (Ticker: PFSZX). As of June 2011, it has 53 holdings and the top 10 stock holdings are BNP Paribas (4.3%), Itau Unibanco Holdings (4.0%), BB&T (3.7%), Lender Processing Services (3.7%), Julius Baer Group (3.6%), Banco Santander (3.6%), Bank of America (3.4%), National Bank of Canada (3.4%), Mitsubishi UFJ Financial Group (3.3%) and Standard Chartered (3.2%). The top three countries of this fund as per assets concentration are United States (24.9%), Switzerland (12.8%) and Brazil (11.9%). 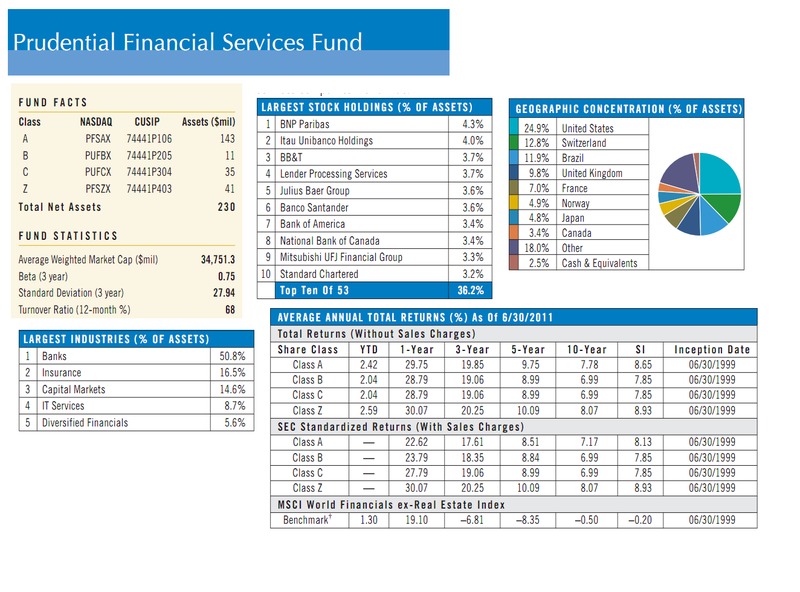 As of June 2011, the largest industries of this Prudential fund are Banks (50.8%), Insurance (16.5%), Capital Markets (14.6%), IT Services (8.7%) and Diversified Financials (5.6%).